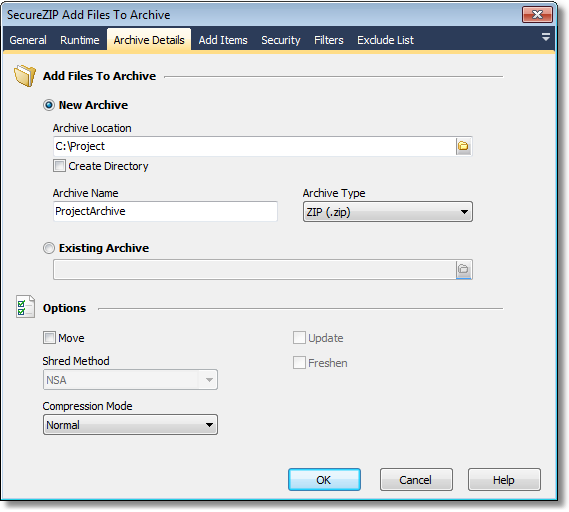 The SecureZIP Add Files To Archive action allows you to create a new archive or update an existing archive. On the Archive Details page specify whether the archive to add files to is new archive or an existing archive. • Archive Location - The destination directory for the new archive. If the directory you have provided does not exist, enable the Create Directory option, which will create the specified directory before creating the archive. • Archive Name - The name of your archive. • Archive Type - This determines the type of archive to create. If adding files to an existing archive select the Existing Archive option and specify the location of the archive to update. • Move - Files that are added to the archive are deleted from the original location once they have been added successfully. o None - No shredding will occur, file will only be deleted on move operation. o Random - Overwrites the files once with random data. o Dod5220 - Overwrites the files three times. o NSA - Overwrites the files seven times. o Store - Provides no compression, simply stores files within an archive. o Speed - Provides fast performance but lowest compression. o Fast - Provides second fastest performance with low compression. o Normal - Provides the best balance between compression and speed. This is the default option. o Maximum - Provides the maximum level of compression with the slowest performance. • Update (only available when updating an Existing Archive) - This option allows you to update an existing archive by adding only new or modified files. • Freshen (only available when updating an Existing Archive) - This option allows you to freshen an existing archive by re-compressing files modified files. The Add Items page allows you to specify files and directories to add to the archive. If you are using the Update or Freshen options to modify an existing archive it is not necessary to specify items here. As an alternative to listing all the items in the Selected Items field you can create a text file that contains the list of items to add and use the Get Selected Items From Text File option to specify the items to add. • Recurse - Allows you to store all the files that exist in the subdirectories of a specified directory (by default subdirectories of a specified directory will be ignored). • Path - Stores paths for files included in the archive, which allows you to recreate a directory structure on extraction. The path option only saves files that are referenced, subdirectories will be ignored. • Directories - The directories option combines the Recurse and the Path options. By selecting this option, the path information for each file will be saved and each subdirectory (and the files within) will be added to the archive. 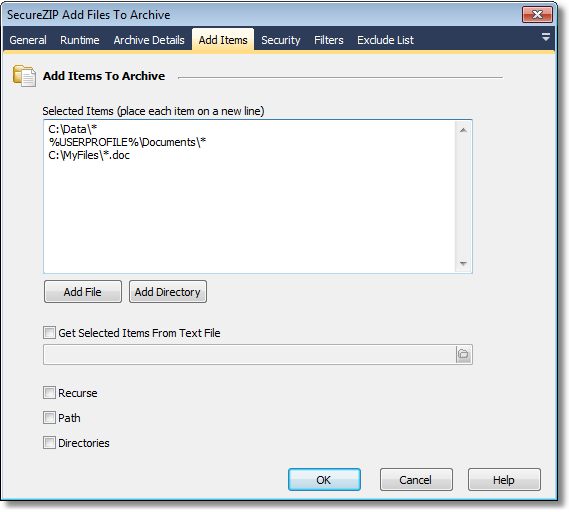 • To secure an archive see the help for the SecureZIP Security Page.